Boneguard is wrapped around the bones and meat to prevent punctures when Vacuum Packing and packing meat into Shrink Barrier Bags. We stock two types of Boneguard, P.F and Mouldable Crepe. 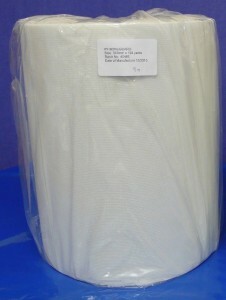 P.F Boneguard is generally used for wrapping around large bones and particularly sharp bones and is used widely in the Game industry. We stock 303mm wide and 400mm wide rolls both are 100 yards in length.